Some nice games with galleys going on in the blogosphere. First, Francesco at ' Into the Maelstrom' HERE. Has some scaled-down Hotz ships! Great ot see someone using card ships. He has a variety of types and a game report. Then some lead slugging it out. 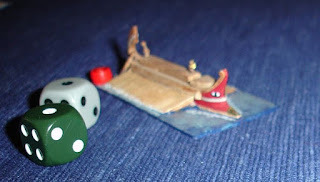 Nice game report at Sun of York's blog. Using 'Song of Blades and Heroes' based rules.